My last trip onto the beach was May 19th. 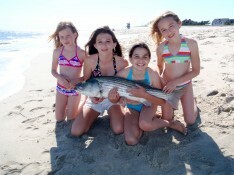 I fished with Rich S. and his girls, Chloe and Charlotte, as well as my daughters, Brynn and Chloe. We set out 5 rods with fresh Clam. Wind was out of the NE at 15-25, and the current was screaming. We had clean water for the last of the outgoing, but it got more and more dirty with the incoming tide. Rich’s rod was the first to go off. It bent over and darn near touched the beach! 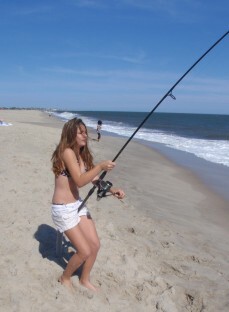 As he was fighting the fish, I cleared the remaining rods, as she was dragging him down the beach. He finally wrestled the big girl into the wash where I snatched her up. She measured in at 42″ and 28#’s. 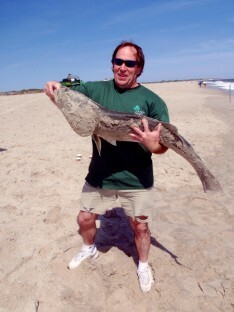 It was Rich’s first ever keeper from the beach. Way to go Rich! It was a bit slow afterward. And as I stated, the water was getting really dirty. Finally, just as we were about to call it quits, I noticed cleaner blue0green water filtering in behind the muddy, grass infested waters in front of us. I heaved a fresh Clam out and hit just inside the clean looking water. As I turned and began organizing gear for the walk off the beach, the lady who’d been sitting next to us yells over “Hey! I think there’s something wrong with your rod!”, not really something you ever want to hear from a woman… As I turned to look, I saw my rod was bent over hard and streaming off line. I pulled it out of the spike and set the hook. About the same time, my oldest, Brynn, sidled up next to me and asked for the rod. So, she fought the Bass into the wash, after a great struggle mind you. This one measured in at 36″. Her biggest from the beach. So, we managed 2 fish on a fairly nasty day, condions-wise. Rich and Brynn each got a personal best to boot! Lots of fun had by all.